Medicine balls (or fitness balls, exercise balls, call them what you will) have been around since ancient times. Hippocrates was one of the first to make use of such a device, using animal bladders sewn together and filled with sand. Today, they come in a myriad of sizes, colors, and types and athletes in just about every sport you can think of make use of them. 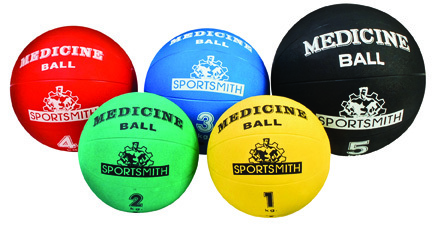 SPORTSMITH™ carries several different types of medicine balls to meet our customers varied and always-changing needs. Here is a quick rundown of what we carry. These are the no-frills smooth balls. They are quite “bouncy”, and come in several weights. First, we have the Standard Weight set, which comes in 1, 2, 3, 4, and 5 kilogram weights. Each ball is differently colored depending on it's weight, so there's no confusion as to what ball you're using. Several different styles of storage racks are available for these balls as well. You can purchase these individually, as a set of 5, or as a set of 5 including a storage rack. Made of a super tough rubberized shell with a weighted core, these balls are easily inflated with any standard sports ball pump. These balls are made of the same tough outer shell and weighted core as the standard balls, but feature two textured handles on each side. The handles are molded directly into the material, so the ball retains a perfect sphere shape. Balls with handles allow you to do different exercises that the standard balls don't allow, and you can even substitute them for actual lifting weights in a pinch. Available in 5 different sizes, like the standard ball, each weight is color coded. Uses the same storage racks as the standard ball, and the same sets are available for purchase. Soft medicine balls tend to be used somewhat differently than the harder variety. Normally, you would use one as a follow up to strength exercises. They are also well suited to larger athletes due to their much larger 14” diameter. DynaMax balls are some of the best on the market today. The outer covering is incredibly tough while maintaining it's natural softness. They come in a variety of colors and weights, ranging from the light 6-pound ball to much larger sizes, like 20lbs. Mini sizes are also available for those with smaller hands. Dead Balls, also known as Slam Balls, are for the serious user of medicine balls. They have absolutely no bounce to them, stopping “dead” when they hit the floor, hence the name. Currently, we carry weights ranging from a relatively light 12 pounds all the way up to an absolutely monstrous 100 pound ball. A bright yellow coloration makes them easily visible, and they are constructed of a tough outer shell with a sand filled interior. If you think you know how to use a medicine ball, get yourself one of these and challenge yourself even further. Functional Movement Training is in! Want to get in on the cutting edge of the new fitness craze? Then get back to the basics! Functional movement training is in! For more strength, power, flexibility, and agility, athletes of all ages need to train movements, not isolated muscles. To effectively develop the nervous system for quickness, the muscular system for explosive power and the joints for stability and agility, proper training tools are a necessity! Sportsmith offers the latest in functional training tools to maximize athleticism in all levels of fitness and types of sport. Appropriate for all ages and ability; dual grip medicine balls are a versatile and safe training tool. The vast range of sizes and weight accommodates all fitness and strength levels. Medicine balls have a high level of practicality because so many functional movements can be performed using them. They improve range of motion, upper and lower body strength, flexibility and joint integrity. Medicine ball drills typically combine speed and strength, which develop power, the ultimate goal of any athlete. Numerous full body plyometric exercises can be done using dual grip medicine balls. The long jump toss develops timing combined with explosive power, which is performed by explosively chest passing the ball immediately followed by a long jump. Walk to point of ball landing, and repeat. The forward chest pass develops upper and lower body power by using the entire body to explosively drive the medball from the chest. This teaches the athlete to generate power from the hips and follow through with full upper and lower body extension. To train stability and mobility in the shoulders, the side lateral toss and bent lateral toss are performed by using the shoulder girdle and core to toss the ball to the side. Performed one side at a time, weighted tosses produce balanced strength in the shoulders and greatly reduce the possibility of injury. Used much like a discus, the spinning throw, generates and develops a tremendous amount of rotational power and speed. Standing side arm throws and rotational swings can also be performed promoting shoulder integrity and rotational strength. To work the core, rotation, and spinal stability the Russian twist is very effective. Sit up in a “V” position and pass the med ball hip to hip allowing the core to stabilize while rotating side to side. The non-slip handles along with various weights make the rugged dual grip medicine ball ideal for a multitude of sport specific exercises that cannot be performed with other tools. They can be used indoors or out, in pairs or individually. So grab a medicine ball, and take your training to the next level! Stability balls are a fixture in virtually every training arena. They are a tried and true tool for training the entire body and accommodating virtually every fitness level, from a rehabilitation setting to elite athletes. The strength center of the body is the “core”. Contrary to popular belief, the “core” is not just the ab muscles. The “core” is actually the abdominal muscles as well as the lower back muscles. These muscles engage to support your body in virtually every movement pattern. Whether you are sitting, running or lifting weights, your core is supporting you. To effectively develop and strengthen the many muscles that make up the core you need a tool requiring them to all work in unison. A stability ball requires your low back and abs to work as the stabilizers as well as movers every time it is used. Not only will ball training increase your overall balance, stability, and strength but you can do full body workouts on the ball as well. Stability balls are great home training devices. They take up very little space and you can scale the workout to your fitness level by using the ball in a variety of ways. To work the upper body, place your legs on the ball and perform pushups, developing your core as well as arms and chest. Develop and shape your legs and glutes by placing the stability ball against the wall, leaning your back against the ball for support, and perform full squats with perfect posture. For more challenging hamstring development, lie supine on the floor, place heels on the ball and perform stability ball hamstring curls, holding hips high off the ground. A set of 5-8 hamstring curls paired with crunches leaving your feet on the ball is an effective combination. One-legged sits are a great way to stimulate balance and stability throughout the core and are performed by lifting one leg while seated on the ball for 2-15 seconds, alternating sides. Turn your stability ball and your body into a “bench” and get much more out of your bench press. Lying supine on the ball, clenching the glutes and lifting the core, your body becomes the “bench”. Add dumbbells and perform a bench press movement that now works your lower body as well as your upper! Now simply roll up to a seated position, using no hands and immediately perform an overhead shoulder press, using a tremendous amount of upper back and shoulder strength combined with core stability. Resistance tubes used in place of dumbbells while performing ball exercises add an extra measure of balance and stability. Resistance tubes are also a no excuse way to bring your workout with you while traveling or working out at home. In training the “core”, it is important to not only focus on the abdominals. It is important to balance flexion (abdominal) exercises, with extension (back) exercises. Performed incorrectly, or over emphasizing one muscle group can lead to muscle imbalance, postural abnormalities or injury. A stability ball is very effective in training the core itself because it positions the body for success. Spinal and neck alignment are key in performing proper core exercises. Crunches are the most basic of abdominal exercises, but should never be performed to failure to prevent poor technique. Lie back on the ball to perform crunches, reversing down into a negative depth, extending further than would be possible on the floor. To prevent strain on the neck, try pressing your tongue against the roof of your mouth. Remember, it is necessary to compliment abdominal work with extension exercises. Low back extensions are performed by placing the hips on the ball, planting the feet on the floor, and lifting the upper body away from the floor for sets of 8-15. To simultaneously work flexion and extension, stability ball tuck ins are suitable for higher-level athletes. Holding body in a prone pushup stance, place the feet on the stability ball and pull the knees into the chest performing knee tuck ins for sets of 10. For improved posture, perform weekly the exercises mentioned above, or use your stability ball daily as a chair at your computer desk! Resistance bands are used by a wide variety of fitness practitioners from rehabilitation settings to strength and conditioning programs. Bands are easily adaptable and a large number of exercises can be incorporated into training programs with very little additional equipment. Resistance bands are particularly useful in targeting smaller muscle groups. These muscle groups are often responsible for stabilizing joints, thus making them key in injury prevention. Proven very effective in rehab setting, band style training is also very effective in athletic movements of all kinds. The break resistant braided bands can safely withstand the pressure applied by the strongest of athletes, allowing them to be used in a multitude of resistance exercises. The figure 8 tubing is very effective for one-arm movements, allowing the other hand or a foot to be the stabilizer. The loops and cuffs can be looped around the ankles as added resistance to walking lunges and lateral lunge steps. Hold them in the hands and perform alternating lateral shoulder raises to create outstanding stability throughout the shoulder joint. In movement training, resistance bands, tubing, or loops can turn up the heat of any ordinary exercise and greatly increase its effectiveness. Resistance tubing is so light and compact it is a great home training device and perfect for travel. Say goodbye to excuses, this gym can be carried in your suitcase! Athletes of all ages and types have one common goal: to become more efficient at storing and releasing power. To develop power combined with reaction time and joint integrity, the proper training protocol utilizing the proper tools is critical. To develop this, a combination of stability, mobility, flexibility, strength, agility, and balance must be incorporated. Sportsmith offers a wide variety of implements designed specifically to execute effective agility training. To fine tune motor skills, coordination, and ankle stability, the agility ladder facilitates a multitude of footwork patterns. Further develop neural pathways and reaction time by designing custom patterns using the agility rings and agility dots. Mini hurdles work exceptionally well to develop “high knees” and proper running technique in athletes of all levels. Linear and lateral “high knee” and “quick feet” drills are very effective with mini hurdles, which are quick to reveal a lagging foot. Add reaction ball “throws” against a wall to amplify and challenge quickness! The reaction ball comes in two sizes, and challenges the body’s ability to perform quick cutting movements and coordination, pertinent to a wide variety of sports. Acceleration and strength can be further developed using weighted vests in conjunction with any of the implements mentioned above or in addition to simplified running patterns. Need cardio vascular conditioning? Add a weighted vest to your current conditioning program! To maximize and develop speed in an athlete or individual, the muscular as well as the nervous system must be challenged with different stimuli targeting the fast twitch muscle fibers. Muscle power (the ability to generate force quickly-calculated by multiplying force by velocity) is the key aspect of many athletic events and its training is of utmost importance. Resisted running, overhead med ball throws, jump squats, and line drills all develop muscle power. Many tools can be implemented into speed training programs to more efficiently expedite speed development. For instance, Jump ropes increase cardiovascular fitness along with foot speed. Agility ladders and cones allow custom patterns to be executed, developing acceleration, deceleration, and motor skills. Pair weighted vests with gravity resistance (bodyweight) drills as well as running drills to reach a whole new level of conditioning! Multi dimensional and multi joint movements are the most advantageous in complete muscle integration. Combining the above implements with these types of functional power producing movement protocols will benefit almost any sport and develop the key components of athleticism. Strength is more than the ability to move a heavy weight. The proper tools combined with a progressive, varied training program will equip you to maximize your physical potential. The benefits of strength training are multifaceted. From increased bone density, to muscle growth, to improved self-esteem and confidence. Strength training also increases cardiovascular function and decreases body fat. It is vital in improving speed, power, strength, and muscle mass. Whether the goal is physique enhancement or improved sports performance; time invested in strength training is required. Dumbbells, bodybars, and kettlebells take up very little storage space and are extremely versatile. Perfect for a commercial fitness facility, clinical setting, or home gym. Olympic lifts, bench press, curls, overhead presses, lunges and squats, not to mention hundreds of additional exercises can all be performed using dumbbells, bodybars, and kettlebells. Variation in training, or the idea of “muscular confusion”, ensures the body will never adapt to a point of no longer getting results. Prevent stagnation in your training regimen by continually adding new movements, modalities and implements to every aspect of your program. For example, perform dumbbell overhead presses standing on one foot, alternating arms. Immediately go to a set of walking lunges carrying a body bar. Finish that sequence with 1 minute of kettlebell swings. Now your workout combined not only strength, but also single joint movement training, balance, and cardiovascular fitness. In the area of building all around strength, variety is the key component. Flexibility is vital in the area of injury prevention. Without adequate range of motion, joints are unable to withstand the demands of physical activity with resiliency. The calf muscles are among the densest muscle groups in the body. Injury prevention is key in this area due to the severity of injury if it occurs. Specifically, damage to the Achilles tendon can be career ending in some cases. Maximize your calf and Achilles tendon stretch with the multi –slant board and pro stretch calf stretcher. The rocking motion of the pro stretch enables the lower leg to dynamically warm up, stimulating the neural system for activity. Proper muscular preparation greatly reduces the possibility of injury. The multi-slant board allows several variations in degree of stretch, positively affecting every individual muscle in the calf. Perfect for post exercise stretching. Ideally, one would have access to both devices, due to the variation in muscular need regarding a pre or post exercise state. Which Bottom Bracket Tool Do I Need?